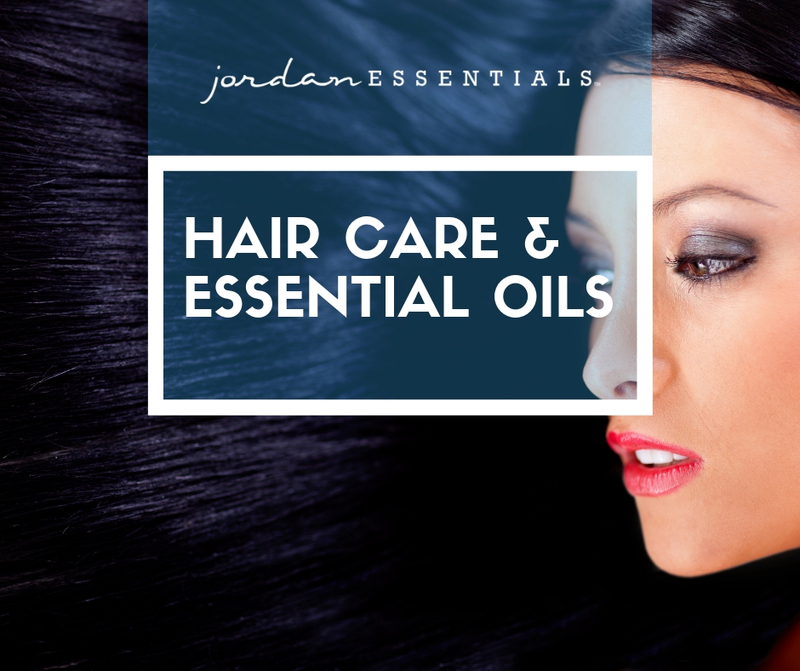 Not only are Jordan Essentials products wonderful on their own, you can combine them to customize the feel, aroma, and benefits to fit your needs. Many products come in unscented varieties, making them perfect for combining with one of our signature essential oils. In this article, let’s focus on hair care. Your hair is the frame for your face and healthy hair starts with good nutrition and conscientious care. Jordan Essentials feels that it is important that you have choices that are free from toxic chemicals that may jeopardize your health. All our hair care products are SLS, DEA, and Alcohol-Free. Perfect to use on their own, or try one of the following recipes, mixing in the benefits of essential oils. Combine 1-2 drops of Tea Tree Essential Oil to about a quarter-sized helping of JE Moisturizing Shampoo and combine. Apply to hair and let sit for 2-3 minutes then rinse. This combination is excellent for everyday use for a healthy scalp and is especially great for dandruff relief. Add 8-10 drops of Headache Blend to JE Leave-In Conditioner and/or Styling Gel. Headache Blend has a delightful aroma and isn’t just for headache relief. The carefully selected blend of Basil, Lavender, Peppermint, and Frankincense can stimulate the scalp, uplift the mood, and support mental clarity. Combine 1-2 drops of Lavender Essential Oil to about a quarter-sized helping of JE Everyday Shampoo and combine. Apply to hair and lather, then rinse. Use this combination in your nighttime routine to encourage a good rest. For issues with lice, fleas, or ticks, add 8-10 drops Headache Blend, 2 drops Eucalyptus Essential Oil, and 2 drops Tea Tree Essential Oil to an 8 oz bottle of JE Everyday Shampoo or Moisturizing Shampoo. This combination works on dogs too but is not recommended for cats. Customize your JE Shampoo and Conditioner with your favorite Essential Oil or Blend by simply adding a few drops and mix before applying. Use Lemon Essential Oil to improve mental alertness, Peppermint Essential Oil for a cooling and stimulating experience, Orange Essential Oil to uplift the spirit, or Immune Blend to promote wellness. To help remove product build-up and add shine to your hair, in a blender combine ½ avocado, 2 Tablespoons argan oil, 1 Tablespoon apple cider vinegar, and 8-10 drops JE Headache Blend. Pulse until smooth. Work the mask through dry hair from roots to tips. Clip your hair in place and allow to sit for 15 minutes or so, and then rinse. Follow with JE Shampoo and Conditioner. For a dry, itchy scalp, combine 4 drops of Lemon Essential Oil with 2 Tablespoons Olive Oil and 2 Tablespoons Water. Mix and massage into damp scalp. Clip your hair in place and allow to sit for about 20 minutes, then rinse and shampoo hair with JE Moisturizing Shampoo. For sun-damaged hair, you can’t get much better than a honey treatment! Honey is a natural humectant, which means it can attract and lock in moisture. Combine approximately ½ cup honey, 2 Tablespoons Olive Oil, 1 egg yolk, and 2-3 drops of Peppermint Essential Oil. Massage mixture into clean, damp hair and let sit for 20 minutes. Rinse with warm water. For more information about Jordan Essential Products or to place your order, get with your local Independent Consultant today, and feel free to comment below with testimonials or results. We know you’ll love trying these combinations for yourself. Jordan Essentials does not claim to diagnose, cure, prevent, or treat any disease. Consult your doctor about any specific health issues. Do not ingest essential oils. Not endorsed by the FDA.